"Perhaps you may know that there are many political parties in a country but when the country's total responsibility has to be executed, they become combined. To have some little disagreements among yourselves is not very unnatural because we are all individual beings. But as we are working on behalf of Krishna, we should always forget our personal interests and see to the prime cause." 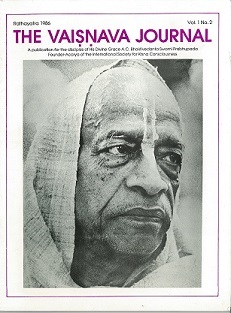 Shortly after Srila Prabhupada physically departed from this world, I joined the Middle East program. 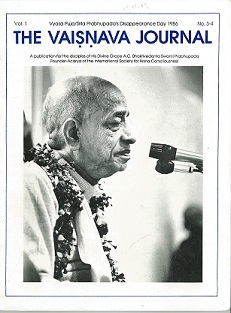 Since there were no temples in that part of the world, we simply carried on as we had always done—chanting Hare Krishna and worshiping Srila Prabhupada as our guru and the founder-acarya of ISKCON. But while visiting temples in India and Europe for short breaks, I noticed things were becoming increasingly difficult for devotees and the movement. So when the Middle East program had finished its course after five years, I humbly tried to make a positive contribution towards keeping our movement and the devotees together with Srila Prabhupada in the center. 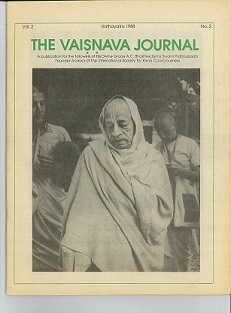 The Vaisnava Journal was created and distributed to ISKCON leaders and devotees worldwide with that objective in mind. 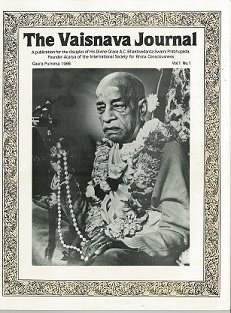 At the time we had Back to Godhead magazine and the ISKCON World Review, but neither of these publications addressed the topical issues of the day which were affecting the stability of Srila Prabhupada's movement. 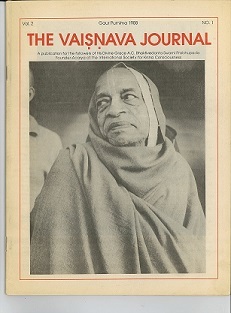 I saw a great need for open and respectful communication in our society, and by Krishna's grace, devotees of all persuasions and positions responded favorably. We openly discussed vital issues of concern to our movement and many spirited exchanges resulted. Unfortunately after five issues I was no longer able to support the rising publication and mailing costs on my own, so I had to stop work on the journal. However we now have a record of those discussions and our readers can research the contents online. Please click on the cover photos below to access each issue in PDF format.